In April 2019 my wife and I had the pleasure of joining the Tasmanian Walking Company Wineglass Bay Sail Walk for four days. From booking to departure it was a wonderful experience. For complex reasons we had trouble selecting a time but Naomi, who looked after our booking, never lost patience and all turned out very well. We met the six other members of the on the trip and were warmly welcomed by Vito, our guide, who in no time at all had us unpacked, labelled , re packed and on the bus. There was a change of plan in that we went to and from Maria and Triabunna by ferry and then settled into our new home the beautiful Lady Eugenie. This was the first and not the last demonstration of the attitude to safety of skipper Colin and crew Mary. The boat had a draft of 2.5 metres so transfer for passengers was by a “rubber duck” tender and the direction the wind was blowing meant that we probably would have got wet so ferry it was. This attitude was not overdone but it was obvious that Colin was attentive at all times to the passengers and also the elements and made minor changes in plans to ensure comfortable nights. 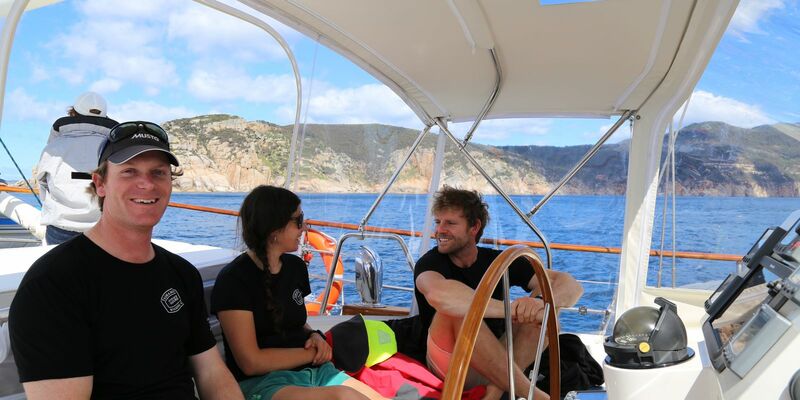 The scenery was magnificent on land and sea and the explanation of the natural and many man made features by Vito was a real highlight and opportunity to catch our breath. It was very informative and a lady from National Parks even had an Albatross wing to demonstrated how wind over the wings of birds and indeed aeroplanes causes lift and therefore allows flight. My wife and I are in our seventies and I confess lagged behind a little (particularly me) but we were treated with patience and kindness by Vito and the other guests. Incidentally there were three couples and two singles and we got on extremely well and I think it highly probable that we will meet a couple form the USA and perhaps an Australian lady again. It was a happy ship and no wonder. The US couple and us were celebrating Golden Weddings, a lady her 50th birthday and another man and lady ( not a couple) were individually and imminently expecting their first grandchildren and to use a quaint old term I did sense the presence of a few shafts of Cupids bow striking home. Unfortunately my wife broke her little toe and could not attempt the 300m 1000 step hike into Wine glass Bay and I thought it would be too much for me. We stayed on the boat and had a cruise to pick up the intrepid climbers. A nice touch on the way home in the bus was to do some wine tasting and enjoy a lovely afternoon tea at the Darlington winery. Last but not least was Mary the trained chef, experienced sailor and most organised person I have probably met. She fed eleven people breakfast, organised lunches, morning and after noon tea and dinner every day in what is a vey small kitchen, sorry galley. A happy, wonderful and capable person who ,although Scottish, has an Irish accent that she denied firmly when I mentioned it and threatened me with all sorts of dreadful things so I said my hearing was not good and clearly I made a mistake.